Goals: Treatment of the forehead wrinkles to eliminate the worry lines. 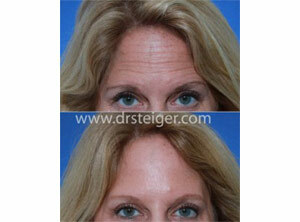 Goals: Dysport Treatment- In this woman, Dysport was used to achieve a more youthful appearance. Dr. Steiger can strategically place Dysport to proportionately raise the eyebrows and improve the forehead and glabellar lines. Notice the improvement and elevation of her eyebrows by the outside corner of her eyes. 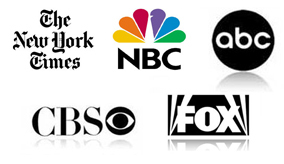 Goals: Botox and Dysport injections are frequently performed to help eliminate facial lines and wrinkles. Another less known use of this products is to improve the appearance of a gummy smile. Some people have a gummy smile when the muscles of the upper lip are overactive. Using Dysport or Botox within these muscles will help relax them and improve the smile. 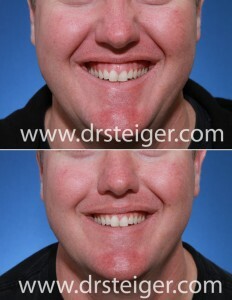 These photos are of a patient 1 week after Dysport injection for a gummy smile.